Sinology is the study of Chinese Classical Books, Wisdom and Philosophies. Understand The-Way(Dao) and you can master life. However, Dao is not physical to allow you to sense it and measure it. There is nothing to compare it with. Yet it is the Power that keep all things working in proper order. 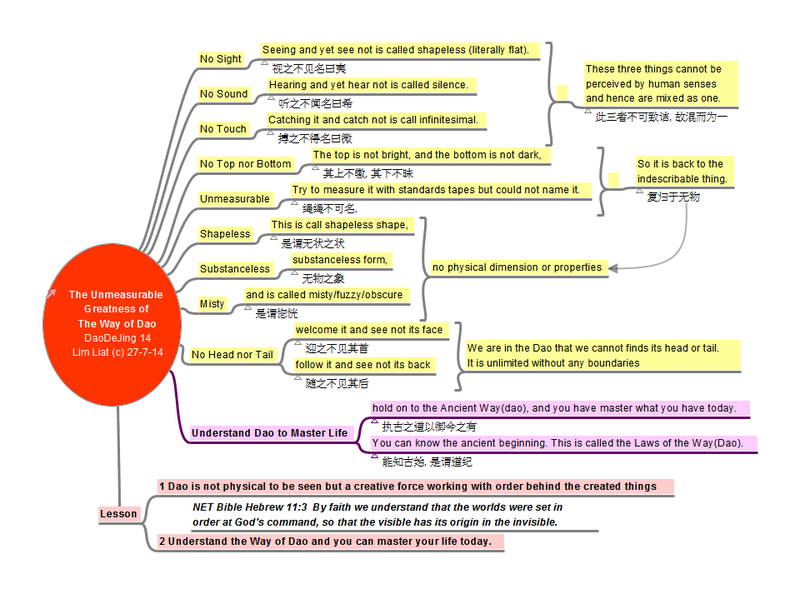 You can also know the Way of Dao through discovering such orders and then you can apply it to master this life. Lao Zi wrote 81 short chapters to describe the working of the Way(Dao). There is a book that precedes Lao Zi’s Dao De Jing that described working of the Way more systematically. It is the Book of I-Ching. To know more, please see Manage Change with I-Ching, or Ancient Chinese Wisdom. These seven attributes are not only the ones that help you become great but also about staying great. It is greatness without any fault. The seven are position of humility, a big heart, relating with kindness, communication with integrity, management with order, working with your abilities and acting on the right time. 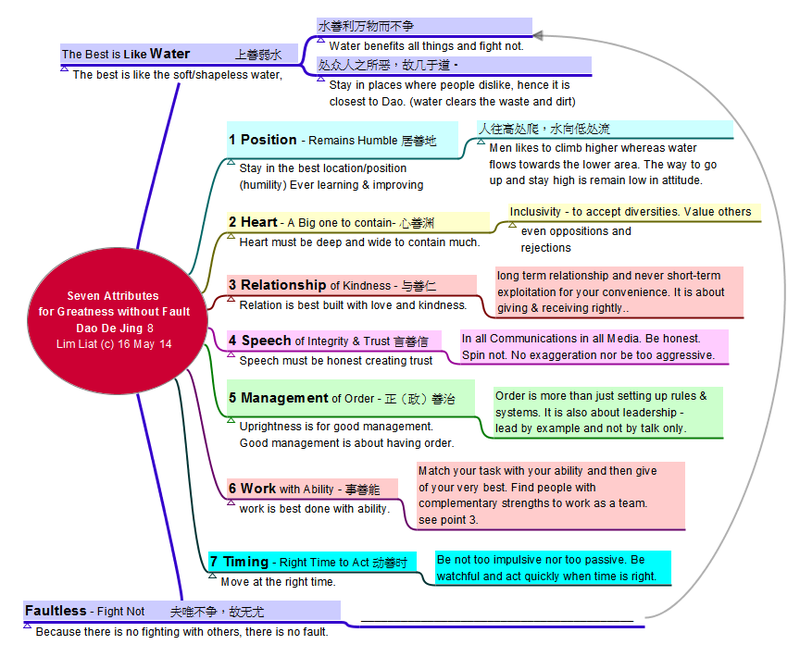 Here is the mind-map containing the original, my translations and extensions for becoming and staying great. The ‘Art of War’ of Sun Zi contains 13 chapters. The challenge is to capture the essence and yet without loosing any key details in as short a form as possible. Here is the Formula that tells you all. I spent many weeks reflecting on how I can express the content of Sun Zi’s Art of War in as short a form as possible and at the same time not loosing any key details. The short form is good for us to remember, recall and to apply it into the many business decisions that we face. It can be expressed in one Chinese Word – 势 Comparative Power. To be clearer, Sun Zi teaches us about how to 造势 Create or build Comparative Power and then 取势 ride on the wave of the created power. ‘知彼知己’ ‘Know Others(Competitors) and Know Self’. The ‘how to’ is expressed in the famous quotation of ‘知彼知己’ ‘Knowing Others(Competitors) and Knowing Self’. This is about building our strengths relative to our competitors or in the modern management term of ‘comparative’ or ‘competitive’ advantage. Sun Zi used a bow and arrow to illustrate power and speed of action. The distance the arrow can reached is dependent on much the bow is bent (potential power or energy that we must build) and how fast the trigger, the arrow is released. What is frequently omitted is in the second part of ‘知天知地‘ , which is ‘knowing the timing (seasons and wealther) and knowing the terrain (or more precise, the shapes and advantages offered by the terrains such as cliff, narrow passage, water obstacle etc). Sun Zi not only tell us how to build our strength with his five factors of philosophy, timing, terrain, leadership and policies and seven measures which include the strength and skill of staff; he also tell us to make use of, or exploit the potential power from the external environment ot timing and terrains. Making use of the natural tendency offered by Heaven (Timing, Seasons) and Earth (Terrains), will allow us to have power without any of our effort! We just ride the tidal wave. Making use of nayural forces or tendencies is best illustrated with a puzzle. “How do you feed pepper to your cat?”. Hint: The answer is in the natural tendency of the cat. The last part then is the engagement between us and our competitors. The is for winning is to surprise them or in modern management term, out innovate them! Another way is speed. We can also sieze the initiative by out menuerving the competitors with deception, tempting, threatening, creating chaos, division, angering, waiting while they labor and spend, attacking their weakness etc. The tagline for Art of War is then about build your comparative advantage over them, ride on the natural trends and out innovate them. Sun Zi was taking about war. 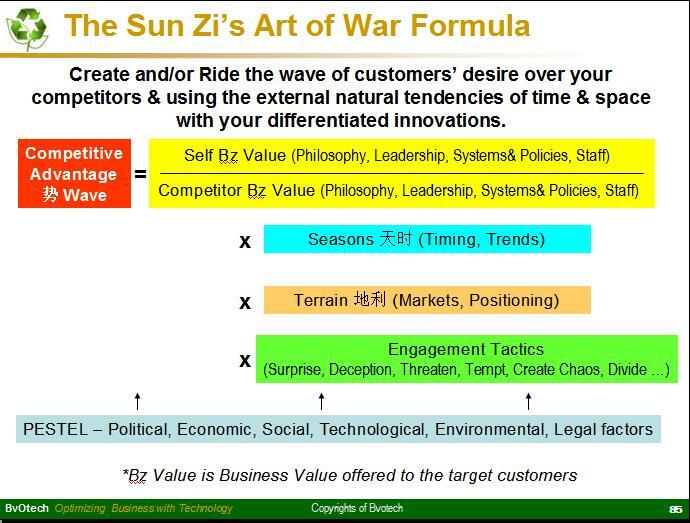 To apply Sun Zi’s wisdom in today business world, we need to know one key thing – Business is a love affair with us customers first with our competitors being used as reference to evaluate our business value that we bring to our customers. The best way to out do our competitors is actually to focus first on serving and developing relationship with our customers. We keep track on our competitors is only for the purpose for serving and increasing our value to our customers. We make use of what our competitors are doing that we may do add even more value to our customers. Hope you can grasp the essential teaching of Sun Zi’s Art of War. Successful people behave differently from the common people. Winners act differently from the losers. Here is some guidelines from Confucius about how wise gentleman shall behave. Does the list give you some new pointers to improve your behavior? Enterpreneurs have special keen eyes to spot the opportunites for new business whereever and whenever they make visits. They notice the difficulties that workers have in doing their jobs. The makeshifts temporary solutions to make the job easier. The environment noices and cleanliness where the job was performed. The frequent stoppages and interruptions. For many people, they could not even notice the new hairdo or new dress that their spouses have put on! Listening is not just about paying attention to what is said. It is also about hearing what are not said and the real meaning for the speech. If there be any lack of understanding, it will be good to ask to clarify if possible. 色思溫，Facial Expression is to be gentle and welcoming. It is easy to be rude to people. Just give them some faces or looks. A smile is very attractive. Giving respect begats respect. If you show respects to others, others are more willing to teach and guide you. Praising others are good but it should be done with sincerity and truthfully. Otherwise, the praises without sincerity actually become insults. It is easy for people to tell. Even though we are encouraged to tell the truth and be honest, we must know how to cover the truth with grace. Truth could be cutting and hence when we speak it, it has not be done in love. There is the saying that any task worth doing is worth doing it well. The pursue of excellence is the foundation for all great work. If there by any doubt or lack of clarity in our thought, then we should ask questions to get the right answers. Not asking because of loss of face or mere laziness show our lack of learning and improvement. 忿思難，When angry, consider the potential bad consequences before blowing up. It is easy to let it out and let the other have it when we are angry. It takes great self control to hold our our outburst and use it as a starting point to find out. Emotion acts as your emotional “sensors”. They are to be indicators of reality, not fabricators or framers of reality. … Ravi Zacharias. When offered an opportunity, it is easy for us to jump at it and take advantages of. But we must consider the rightfulness of doing it first. Profits from short-cuts, cheating, beating the laws are but temporary. The consequences on self and related others could be worse in the longer term. The best way to make money is to make them righteously. It will be long term and you can sleep peacefully. If there be one word that unit the nine considerations, it is about taking interests to know more about whatever you may find yourself in. Having the interest to know more about things and people will enrich not just your knowledge but also the people relationships. You interests in others triggered corrsesponding interests in you by the others. Hope you pick up some pointers for improving yourself.